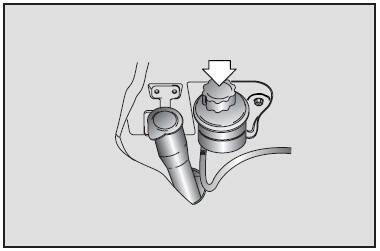 With the vehicle on level ground, check the fluid level in the power steering reservoir periodically. The fluid level should be between MAX and MIN indicators on the side of the reservoir. If the level is low, add fluid to the MAX level. In the event the power steering system requires frequent addition of fluid, the vehicle should be inspected by an authorized Kia dealer or another competent repair center. To avoid damage to the power steering pump, do not operate the vehicle for prolonged periods with a low power steering fluid level.